Gus was born in Surrey, England in 1934 and studied at London. Gus moved to Brisbane in 1973 to the Griffith University as Professor of Chemistry and Dean of Science. In 1986 Gus went to Sydney as Vice-Chancellor and President of the University of Technology, Sydney (UTS). He was made a Member of the Order of Australia in 1996. On leaving UTS Gus set up his own consulting company. Always fascinated by clowning, Gus attended the second of Barbara Brewster's “Clowning for Cowards” workshops in Buderim in January 2001 and never looked back, and "Charlie" was born. He became the inaugural President of the Coastal Caring Clowns Inc. in July 2001, an office he held for 5 years (as well as being Secretary for the first 3). Charlie enjoyed visiting both hospitals and nursing homes and was happy to help and encourage new clowns. He enjoyed doing simple magic, especially card tricks. Charlie has, over the years given many informative talks down the Coast to try to spread the awareness of caring clowning. 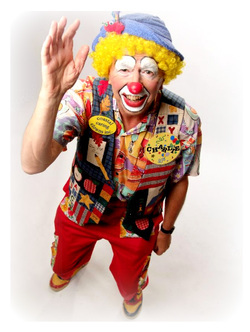 On 16 August 2010 Charlie was appointed a "Life Member" of the Coastal Caring Clowns for his continuing services to the organisation. On 12 January 2013 Gus passed away after a brave fight with cancer. His influence on the group cannot be overstated and his legacy will live on. Vivian Thresher was one of the Coastal Caring Clown’s founding members. Her early study was at the Guildhall College of Music and Drama in London. She then worked in minor TV and broadcasting roles and then as a speech therapist and a speech and drama teacher. She worked in the UK and Australia and spent much of her childhood growing up in Perth and Malaysia. When she came to live on the Sunshine Coast she was drawn to the activities of the Coastal Caring Clowns. Vivian was a most enthusiastic member and was the activities officer for several years. With her past training in speech she would like to include impossible tongue twisters at clown meetings. This training was also evident in the way she would relate poems and jokes in her clown work. Vivian’s positive outlook and vibrant enthusiasm for clowning were infectious and she was an inspiration for fellow clowns. Viv passed away in 2010.